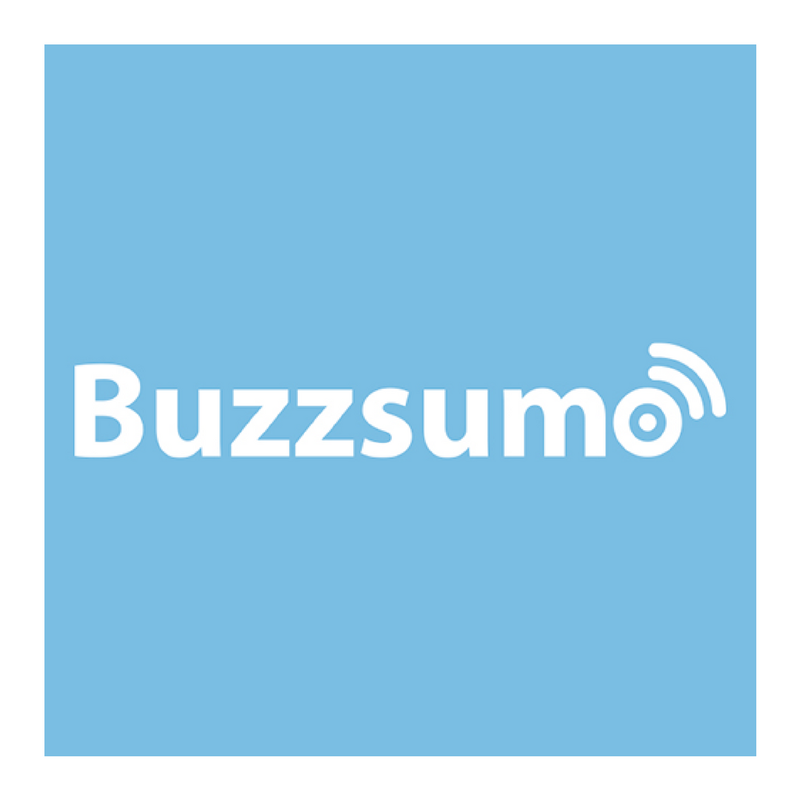 BuzzSumo can enhance your marketing strategy to help you create excellent quality content. The marketing world is so busy – new content is published constantly and it can sometimes be hard to know what your next step should be. Lucky for us there are some excellent tools out there to improve our content marketing strategy, with leading tools like BuzzSumo. 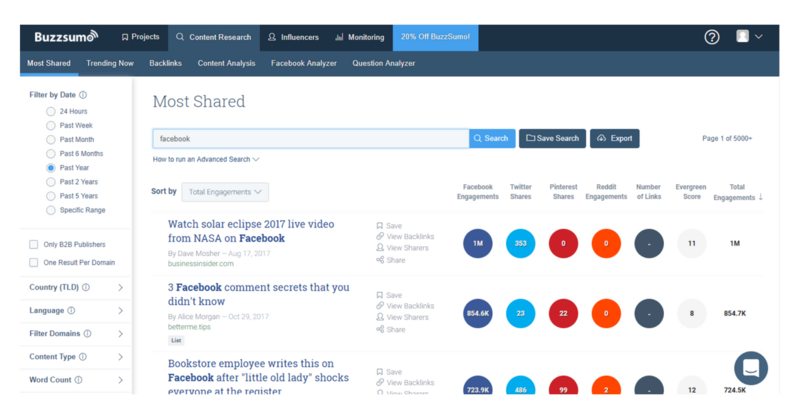 BuzzSumo gives us the tools we need to ensure our content stands out, generates engagement and gets shared. It can help boost site authority, analyse your backlinks as well as those of competitors to boost your ranking. It can take a tedious amount of time to uncover what your target market are talking about, what they’re interested in reading and what they typically engage with. But to provide people with information they want, you need to know what content is popular at the moment. BuzzSumo does all the searching, analysing and discovering for you, it’s a lot faster too. Sometimes you sit and think what to write about and come up with absolutely nothing. Not only is it time consuming, but it’s a complete waste of time when a tool like BuzzSumo can do the thinking for you. 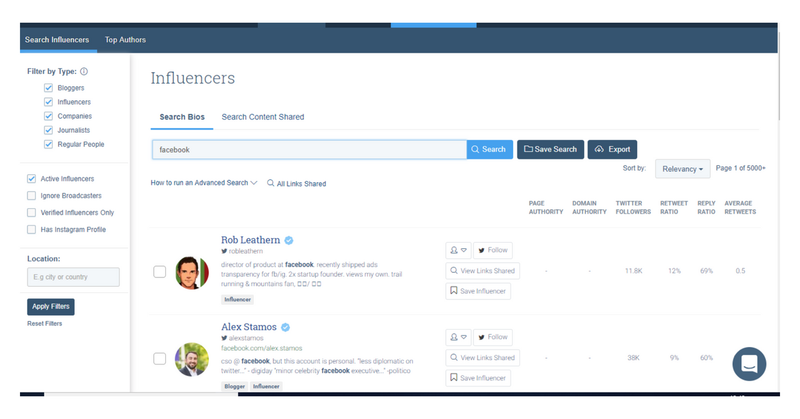 BuzzSumo can give you content insights by scanning multiple social sites, so you know what people are talking about. It will generate what’s getting the most attention, you may want to share existing popular articles or create your own to give to your audience. Take a look at our example below, simply by typing in Facebook we’ve discovered what’s most popular at the moment. As a Digital Marketing Agency, we regularly post about Facebook since it’s in our niche. There are advanced searches available, where you can exclude words, search multiple words, find an exact phrase and loads of other filters. Getting an industry influencer involved can help considerably to improve the visibility of content. Find out who people are listening to most, who gets a lot of social media shares and who the public seem to trust. Then you can try to get them on your side. A simple search of a topic or phrase will result in a list of influencers who are leaders within your chosen topic. The excellent tool makes keeping up-to-date so much easier. – Watch brand mentions, the success of your competitors’ content and who is linking to you and track your progress over time. Unsure of what to track? Use Google Keyword Planner with BuzzSumo to ensure you’re monitoring the most relevant keywords and phrases to your industry. To access all of BuzzSumo’s fantastic features there is a cost, you can check out all their plans here. BuzzSumo is one of the must have tools for businesses to use to enhance their marketing efforts. Even if you don’t want to pay for a plan, the free version comes in handy for content creation.